Lee, Po-chih and Arthur Porter. "Electric Power". The Canadian Encyclopedia, 02 April 2019, Historica Canada. 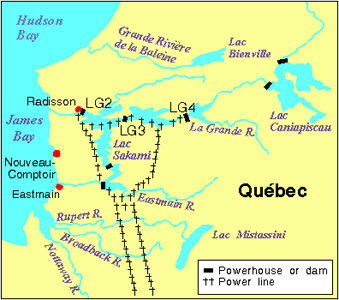 https://www.thecanadianencyclopedia.ca/en/article/electric-power. Accessed 20 April 2019. Electricity is a property of the atomic structure of matter, and is manifested as attraction between 2 oppositely charged bodies or repulsion between 2 similarly charged bodies. The graph shows the amount of energy produced in Canada by each method (artwork by Michael Lee). 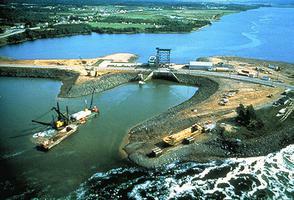 The Annapolis Tidal Power Plant was the first to transform tidal energy to electricity (courtesy Tidal Power Corp). Electricity is a property of the atomic structure of matter, and is manifested as attraction between 2 oppositely charged bodies or repulsion between 2 similarly charged bodies. Subatomic particles may have a positive charge (proton), a neutral charge (neutron) or a negative charge (electron). Electrons are mobile and can be activated to create electric currents if a low-resistance path (conductor) is provided. These currents provide a clean, controllable, versatile energy commodity which has been largely responsible for profound changes in the quality of life of all Canadians, reducing, for example, drudgery in homes, farms and factories. Some uncontrolled forms (eg, lightning) occur in nature. The widespread availability of cheap electric energy (notably hydroelectricity), made possible by large, integrated power systems, has given rise to major industrial developments across Canada. Many Canadian industries such as aluminum, pulp and paper, iron and steel and chemicals consume large amounts of electricity. Gravitational energy, solar energy and its derivatives (eg, coal, petroleum, biomass, wind), tidal energy, nuclear energy, etc, are primary energy sources. In contrast, electricity is usually regarded as a secondary energy source, since it must be generated by the conversion of gravitational (falling water), chemical (fossil fuels) or nuclear energy. Conversion typically requires 3 units of input energy (eg, burning coal or falling water) to produce one unit of electricity; the other 2 units are wasted as low-quality heat. The generic inventions that gave birth to electric-power generation were the water wheel (used in Roman times to grind corn), the steam engine and the dynamo or electric generator. The harnessing of water power in the 19th century, notably to drive textile mills, corn mills and woodworking and metal-shaping machinery, was largely responsible for Canada's emergence as an industrial nation (see technology). With the development during the 1870s of reliable electric generators of adequate capacity, it was logical to generate electricity based on hydro power as well as on wood- and coal-fueled steam engines. The product was used originally for electric lighting and later for the host of applications that characterize contemporary society. In 1881 a 1.86 kW steam-driven electric generator was installed in downtown Toronto and the first skating rink was lit by arc lamps. Electric arc lights were installed at the Canadian National Exhibition in 1882 and in 1883 street lighting was installed in Toronto and Montréal. In 1884 the Ottawa Parliament Buildings and University of Ottawa were lighted electrically with generators powered by steam engines. All the streets of Ottawa were electrically lighted in 1885; it was the first city in the world to achieve this distinction. Several other Canadian cities such as Montréal, Québec City and Sherbrooke were supplied with electric power in varying degrees before 1900, but the transmission of electric power from Niagara Falls to local communities in 1906 heralded the real dawn of the age of electric power in Canada. Subsequently, in 1910 the Hydro-Electric Power Commission of Ontario, one of the world's first integrated public electric utilities, completed the first 110 000-volt bulk electric-power transmission lines to supply several municipalities in southwestern Ontario. This major achievement placed Canada in the forefront of electric-power pioneering nations. 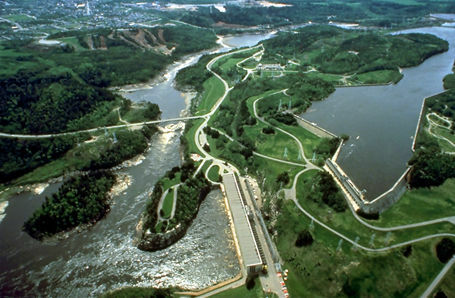 By 1920, hydro accounted for more than 97% of total electricity production in Canada. The first Canadian thermal-electric (coal-burning) power station with an installed capacity of 1 million kW was put in service in 1951 in Toronto. Canada's first nuclear-power plant, at Rolphton, Ontario, first delivered power to the grid in 1962. It was based on the Canadian deuterium uranium reactor (CANDU) subsequently used in Ontario's Pickering and Bruce generating stations, which have proved the world's most reliable commercial nuclear plants. In 1994, total electricity production in Canada was 533 508 GWh (gigawatt-hours). Of this total, hydro accounted for 61%, followed by nuclear power (19%), coal (15%), natural gas (3%), oil (1%) and other sources (1%). To meet total requirements, an electric power system must have sufficient installed generating capacity to satisfy the peak demand and the capability to supply the total energy requirements. In 1994, total installed capacity in Canada was 113 877 MW. Of this total, hydro's capacity share accounted for 56%, followed by coal (18%), nuclear power (14%), oil (7%), natural gas (4%) and other sources (1%). Electricity constitutes a significant market share of Canada's primary and secondary energy consumption. The contribution of electricity to total primary energy consumption has steadily increased from 14% in 1960 to 34% in 1994. In terms of volume, primary energy consumption delivered in the form of electricity increased from 463 petajoules in 1960 to 3350 petajoules in 1994, an average annual growth of 5.9%. This is more than double the average annual growth of nonelectric primary energy consumption of 2.5% registered for the same period. Electricity constitutes a much smaller market share of secondary energy consumption than primary energy consumption because of conversion losses. Electricity's share of Canadian secondary energy consumption was 11% in 1960 and 25% in 1994. The consumption growth rate for electricity was estimated to be 4.5% during the period 1960-94. Canada's total electricity consumption has experienced 2 distinct periods over the past 34 years: the first period was one of high growth from 1960 to 1974, followed by a period of low growth from 1975 to 1994. The abrupt change coincided with the first oil crisis of 1973-74. This dramatic reduction in electricity consumption growth was mainly attributed to reduced economic growth, high energy prices and energy conservation efforts. In 1994, Canadian electricity consumption rose by 1.3% to 490 776 GWh, due to slow economic growth. Implementation of demand-side management and relatively warm weather were the other major factors contributing to low domestic electricity consumption. Of the total electricity consumed in 1994, it is estimated that about 42% was consumed in the industrial sector, 28% in the residential sector, 23% in the commercial sector and 7% in transmission and distribution losses. Electricity production in Canada not only provides the need for the domestic market but also provides exports to the US. In 1994, electricity exports to the US increased 53% over 1993, reaching about 44 822 GWh, while imports decreased 65% to only 938 GWh. Exports accounted for 9.2% of Canada's total electricity production in 1994, up from 5.8% in 1993. Exports revenue also increased significantly, by 55% from $858 million in 1993 to $1332 million in 1994, while import cost reduced from $85 million to $45 million. The export of electricity is an important aspect of Canada's foreign trade. While total electricity export revenue accounted for only 0.6% of total merchandise exports and 5.9% of total energy exports in 1994, net electricity export revenue accounted for 5.0% of Canada's balance of trade and 8.2% of Canada's total energy trade balance in 1994. The electric power industry has a significant presence within the Canadian economy. There were almost 91 000 people directly employed by the industry in 1994, about 1% of total Canadian employment. Total revenue was $27 billion in 1994. Of this total, approximately $1.3 billion or 4.8% came from export earnings. The electric power industry has steadily increased its contribution to Canada's GDP, from 2.3% in 1960, to 2.5% in 1970, to 3.0% in 1980 and to 3.6% in 1994. Canada's electric power industry had a large investment share in the energy sector in 1994, with total capital expenditures of $7.2 billion accounting for 33% of the total investment in the energy sector, and 6% of the total investment in the economy. Total assets of the industry were about $143 billion in 1994, accounting for about 8.3% of the capital stock of the economy. In 1994, Canada's electric power industry invested a total of $7.2 billion, accounting for 33% of the total capital investment in the energy sector. Of the total $7.2 billion capital investment, about 41% was invested in generation, 24% in transmission, 20% in distribution and 15% in other activities. As for sources of financing, Canada's electric power industry has gradually borrowed funds from the domestic financial market. As of 31 December 1994, the total outstanding long-term debt of major electric utilities in Canada was about $90 billion. Of this total, about 63% (or $57 billion) was borrowed on the domestic market and 37% (or $33 billion) on international markets. In the international markets, it is estimated that about 85% (or $28 billion) was raised in the US. Under the Canadian Constitution, electricity is primarily within the jurisdiction of the provinces. As a result, Canada's electrical industry is organized along provincial lines. In most provinces the industry is highly integrated, with the bulk of the generation, transmission and distribution provided by a few dominant utilities. Although some of these utilities are privately owned, most are Crown corporations owned by the provinces, with some investor-owned utilities, municipal utilities and industrial establishments. The federal role regarding electricity is restricted to nuclear energy and international and interprovincial trade (see Atomic Energy Control Board; National Energy Board). The Canadian electric-power industry has pioneered many significant developments in nuclear power, the design of electric-power stations and the production of generators, transformers, transmission lines and energy-conservation systems. 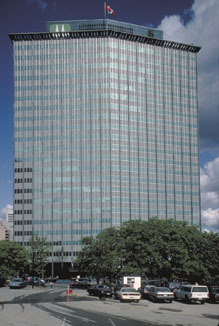 Major research programs are conducted by Hydro-Quebec, Ontario Hydro and the national laboratories of Atomic Energy of Canada Ltd and the National Research Council. Some research areas deserving special mention include the safety, reliability and efficiency of nuclear-power stations; the management and storage of spent nuclear fuel; the environmental impacts of burning coal (eg, acid rain) and methods of minimizing them (eg, SO2"scrubbers"); the design of ultra-high-voltage transmission lines; the development of renewable sources of energy for electric-power generation and small-scale hydroelectric plants. The total national research and development budget for electric-power-related projects exceeds $100 million annually. Economic and population growth in Canada over the next 16 years are expected to be significantly lower than the previous 34 years. It is estimated that the real GDP will grow at an average of only 2.5% for the period 1994-2010, much less than the historical average of 3.9% achieved during the period 1960-94. Population is expected to grow at an average of 1.1% for the period 1994-2010, less than 1.5% registered during the same period 1860-1994. In addition, it is estimated that the country's economic structure will not shift greatly over the same period from predominantly service-producing industries to goods-producing industries. With these assumptions, electricity demand for Canada as a whole is expected to grow at an average of 1.9% during the period 1994-2010. Canadian Enerdata, Canadian Energy Trends (May 1983).